For more than a few months now (since May, to be exact) people just can’t seem to get enough of the cronut, a marvelous creation of NY pastry chef and bakery owner Dominique Ansel of the Dominique Ansel Bakery. The hybrid croissant-doughnut creation elicited such feedback from hungry (and very satisfied) customers do not mind lining up for hours just for the prerequisite two orders (or pieces) per customer. 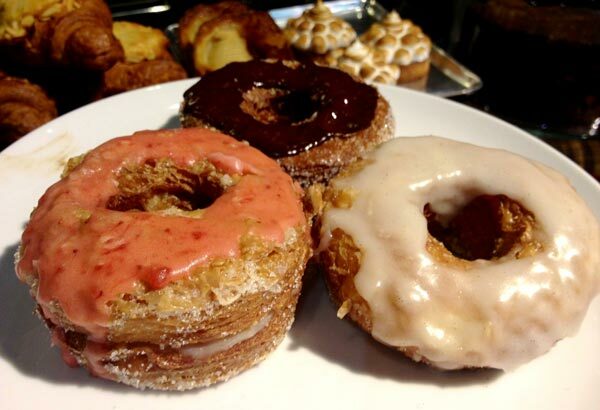 Because the Philippines has such a reputation of easily catching up on what ever is hot and trendy (whatever that means) — variations of the cronut has appeared in the Metropolis, with the croissant-doughnut creation from Wildflour Bakery as the most famous and most successful. Like the Dominique Ansel Bakery, Wildflour has to limit the number of orders per person (2 per pax) in order to accommodate the demand. When you have people in your FB page and Twitter feed going on and on just how glorious it was, any one would be curious if its really worth the hype. I never had the chance — that is, until now. I found myself at Wildflour Cafe + Bakery at Bonifacio Global City earlier this morning. I was in my capacity as the communications manager of the company, baby-sitting the big boss as she gets her first media interview from a major newspaper. So, we ordered brunch — muesli with fresh fruits (mango and banana), flatiron steak with kimchi rice and my personal choice, baguette with butter and jam. Food was simply superb. My baguette came out served in a small chopping board, with the butter and jam spooned into minuscule (and cute) deep bowls. The baguette came out smoking hot, crispy on the outside while soft on the inside. Service was also impeccable. The servers are friendly, quick and efficient: water bottles are promptly filled, used plates cleared and requests immediately answered and attended to. Just when we were finishing our brunch, my boss remembered to order their signature croissant-doughnuts. We were politely informed that 2 cronuts are allotted per table, and if we wanted to buy more–we can also line up outside. We chose to have the 2 cronuts offered to us: chocolate and strawberry. I cut into the well-baked, flaky pastry — expecting to experience heaven and probably hear a choir of angels sing. I tried again, afraid that my pedestrian palette is not worthy of this pastry that recently dominated the hype-addicted headlines of Manila. Nothing again. Do not get me wrong, it is delicious. I particularly loved the subtle hint of strawberry pastry cream peeking under the layers and layers of the flaky, buttery goodness. But if you ask me, I just can’t find where the hype is coming from. I just can’t imagine myself lining up for hours just for this. Maybe, if you would throw in the yummy baguette (with extra butter and jam, please) — I might consider. Yeah, yeah — you’ll probably say that I am just too dense that I couldn’t see yummy goodness when it’s staring back at me; or yeah, my pedestrian taste buds might be too accustomed to the lucisous spanish bread sold by Julie’s Bakery. But one things for sure, this is one plebeian that didn’t get swept by this craze. I actually had the same reaction. I’d rather have the usual donuts or croissants. Although those cronuts you got from Wildflour Bakery looks yummy, better than what I had here in SG.